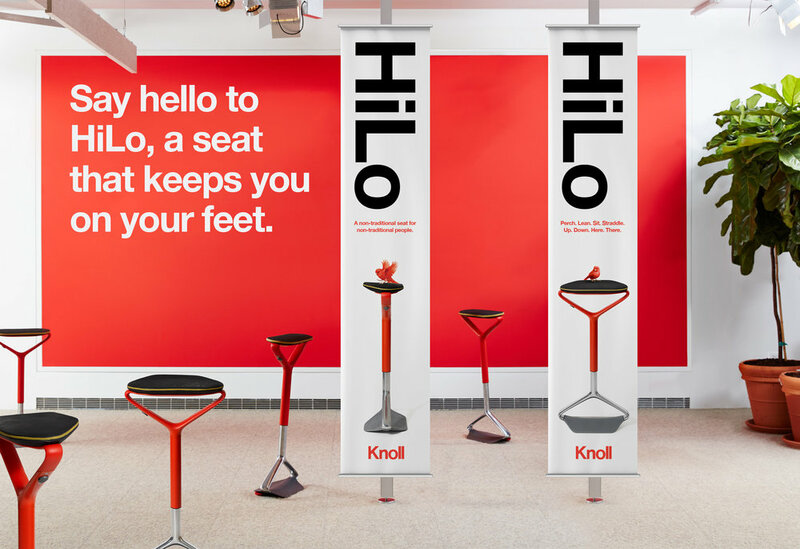 The brand identity for Knoll’s new product, the HiLo. It’s a category-breaker with unparalleled form, designed for standing desks and impromptu meetings. To capture the HiLo’s two main traits – its lightness and mobility, and the unique way the user engages with it – we used the metaphor of a tiny bird alighting on the seat. This simple image evokes curiosity and begs the viewer to follow our bird through all of the literature associated with the product – from brochure, to microsite, to in-store merchandising. The HiLo is a big reveal for Knoll and warranted its own microsite to build interest and to educate. The site captured a variety of images of the product in use (including a tutorial video), production sketches and designer profiles.